Tortoise mating season has arrived and with it, the completion of a tortoise enclosure which will serve as a safe haven for these shelled creatures to heal if they have been injured. This initiative was the brainchild of the Friends Of Our Tortoises (Foot), a Montagu-based group advocating the safety and protection of tortoises. The group was established earlier this year after a Montagu resident found an injured tortoise in her road. The tortoise�s shell was broken and it was in danger of being eaten alive by ants. After a local vet treated its wounds, the problem of caring for the tortoise arose. He says this incident highlighted the need for a caring system for tortoises. With the input from CapeNature, Foot started planning for a tortoise enclosure where tortoises can be housed safely while their wounds heal. . 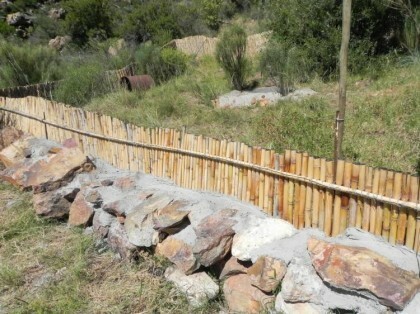 The enclosure is situated on Colin Johnson�s property, popularly known as the Tolhuis, situated in Cogmanskloof. Johnson, who built the enclosure, says he has always had a love for animals, says his property is the perfect location for such an enclosure, because the tortoises can also be released on his property. He says there are many tortoises on his property and he has seen up to 15 tortoises a year. The enclosure, constructed of rocks and reeds, includes enough grass for food, shade, a shelter for the cold winter months and a pond for water with pump to circulate fresh water. Brunings says the next step is to train Foot volunteers to treat damaged and injured tortoises. Elsje Meyer, a local tortoise specialist, together with CapeNature, is finalising the course content which will be presented at a workshop to be held early next year. Brunings urges people to be on the lookout for tortoises on the roads, especially at this time of year when they come out of hibernation.